Dental health is no doubt an important part of general health and well being. Daily brushing and regular visits to your dentist will ensure that natural teeth as long as possible. Plaque builds up naturally on teeth and if left on tooth surfaces will cause dental decay in the long term. Daily brushing (twice per day) will reduce the amount of plaque building up and the incidence of bad teeth. Plaque is made of up of food debris and bacteria. The bacteria (streptococcus mutans) is responsible for breaking down sugars in our diet and forming acid. This acid in turns causes natural teeth to become decayed. Dental decay affects most of the population in one way or the other. This patient presented at the clinic and requested treatment. The patient was a 45 year old male, who was suffering with pain in multiple areas due to dental infection. 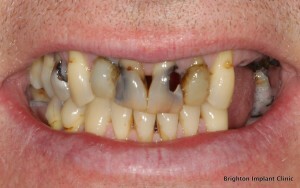 The patient had not seen a dentist in 12 years, and had stopped brushing his teeth regularly more than 10 years before. During the examination impressions were taken of the patients mouth for further investigation. A full set of radiographs were taken in order to assist in diagnosing problem areas. 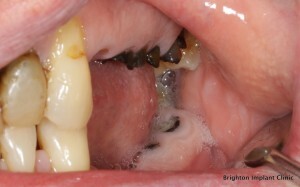 It was decided that the best treatment was to remove the remaining teeth as the existing teeth were extremely decayed. Multiple teeth were infected and needed immediate attention. Even though this patient could benefit from dental implant treatment it was felt that he was not an ideal candidate for dental implant. Dental implant treatment carried a very high success rate. Usually this is around 95% of cases. In other words it is very likely that dental implant treatment is successful even in cases like this. However as a dentist it is important that we consider if the patient is able to follow the instructions while undergoing dental implant treatment. Daily hygiene is very important during the dental implant treatment process. 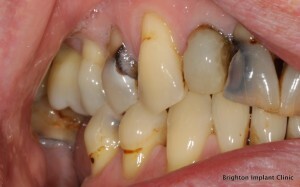 If this particular patient did not brush for over 10 years, then this habit of not brushing will be difficult to change. The treatment therefore should involve removing all infected and non-restorable teeth and alleviate pain. Some cases of bad teeth are not ideal for dental implant treatment. Until the patient is able to demonstrate that they are able to maintain good oral hygiene it is better to delay dental implant treatment. A case like this may very well be more difficult than expected unless the patient changes their habits and starts to look after their teeth. If the implant treatment were to fail who's responsibility would it ultimately fall. ? For further information please Contact Brighton Implant Clinic or Call us on 0800 111 6623.